Be it in the comfort of your own home, or for a party or celebration gathering, Molloy Catering provide an excellent catering service. Contact Carmel at 051 355552 or Jack at 086 2526601. We take care of everything - relax take it easy and enjoy the atmosphere. includes: chefs, service ,selection of salads, pig, equipment, delph, etc. Caters for up to 60 people. 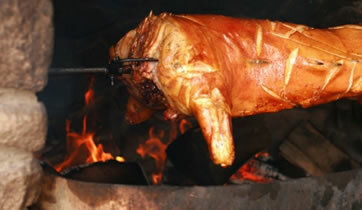 We supply you with pig on a spit fully cooked and ready to carve yourself. With quick and easy instruction this is a great way to provide a delicious carvery roast pig and you take all the credit. For further info ring Jack, on 086 2526601. "Jack and his team recently catered for a house party for us. They provided a very professional service including delivery. The comments from guests at the party about the food was all positive especially about the chicken drumsticks!. Thanks for everything, the catering definitely took the pressure off and I would have no hesitation in recommending Jack to my friends". - Fergal O'Hanlon, Mooncoin.